ISBN: 9781634259071, available for purchase from Barnes & Noble, Amazon or the ABA Store. This book can help anyone take charge of their cybersecurity and privacy, and provides a solid understanding of cybercrime, privacy threats, information security, and technology. It teaches the reader about computers and networks, and then guides the user through implementation of security and privacy measures to protect the individual, home, and family. Then these principles are applied to the workplace, and an overview is provided of the law and professional responsibility requirements. Readers of any technical skill level can take charge of their own cybersecurity and privacy in a methodical manner. Information security can seem overwhelming, but this book presents it in simple steps—first secure your computing devices, then your data, then your networks. These are three pillars of security, the fourth is you and your knowledge. This book is for anyone, and draws upon my experience, training, research, and study. It also had the benefit of two talented editors who not only brought their own legal, information security, and cybercrime investigation expertise, but also the ability to present information in an interesting and helpful manner, regardless of the reader's technical background. The book was further improved with pre-publication feedback by many who brought diverse perspectives in information security, cybercrime investigation, law, business, and more. This book is published by the American Bar Association and is available through Amazon and Barnes & Noble. In this website, there are resources that parallel the book, including photos of a computer's insides, forms to help guide you, and acknowledgements to those who gave generously of their time and talent to help with the book. Technology and the internet is here to stay, along with cybercrime and other privacy threats. Each of us needs to take charge of our own technology, cybersecurity, and privacy. If you haven't started yet, you have to start somewhere, and everyone and every organization has room for improvement. This book can help you with that. 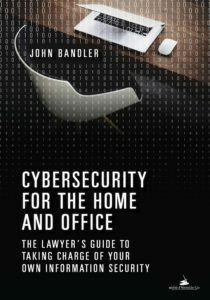 I write articles now and then relating to cybersecurity and other issues, and I compiled a list with links over at johnbandler.com. View website resources paralleling the book. I discuss the book with John Metaxas, an award winning journalist who now offers podcasting services through WallStreetNorth Strategic Communications, see www.wallstreetnorth.com/podcasting/. If your browser has any trouble displaying and playing the audio, you can also hear it at https://soundcloud.com/johnbandler.